My dad died of cancer on March 13, 2003. It was 8:05 am when he took his last breath. I was there when life left the room. It was an experience I will take with me forever. Or at least until my breath too… bids farewell. Dad was forty years older than me. With this, came much wisdom that still seems to find its way along my path to this day. It is amazing the lessons one can learn from a lost loved one long after they have gone. Quite frankly, many of them come in the form of a memory. Though at the time, it was simply life playing out, but… over time, many of these memories seamlessly transitioned into a playbook of lessons meant for daily consumption and application. When did this transition occur? I don’t know. During the last few years of my dads journey, his health had taken a turn for the worse. What started out 2001 with a heart attack, ended the year with lung cancer. As if hearing the words… you have cancer is not enough. Over the next year, dad fought cancer courageously and even knocked it down briefly, only for it to return with a vengeance that December in 2002. It was then that the doctor looked us square in the eyes and said that dad will never be the same again. Those months were hard. I felt so helpless. With dads condition, he would take one step forward, and ten steps back. You found yourself in a place where you became afraid to hope. Instead, you simply sought to live in the moments. With doing this, I realized it wasn’t hope that I needed… it was peace that I was looking for. As I look back, I believe that’s what dad wanted, too. For nearly 25 years I had faithfully rooted for the Tampa Bay Buccaneers NFL football team. For nearly a handful of those years I did not have much to cheer for. Over the years, people could not understand how a person living in Oregon could be a diehard fan for such a losing franchise located on the other-side of the country. I remember how sad I was after that first NFC Championship loss to the then Los Angeles Rams, 9-0. I remember where I was and how I felt. Sadly, it still stings. The Bucs will win the Superbowl in the next 10 years…of course I had said that for the previous 15. Many thoughts passed my mind over the years. What would I do if they ever made it to the Superbowl? I knew for sure the only place I wanted to be was at the game or somewhere in the vicinity of the game. One thing for sure was…a party would be happening. My first Bucs game in person was in the old Kingdome in Seattle. It was 20 years after the Bucs had lost in that game to the Rams. Ironically, they found themselves in the championship game with the Rams again… and lost. Oh so close to that party I had been planning for so many years. Have I told you that I do NOT like the Rams? With the Bucs continuing their winning ways the next season(except for championship games against the rams), my day finally came. 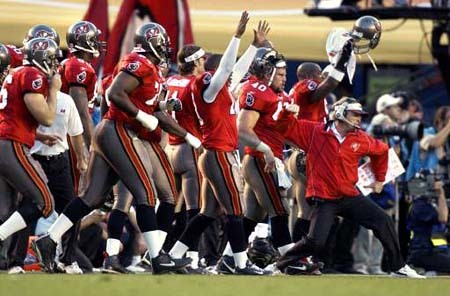 In 2003, The Tampa Bay Buccaneers finally made it to the Superbowl. However, this was not a year for parties. My dad’s cancer had returned, this coupled with a stroke didn’t leave things looking so good. For several days prior to the game, while I was out of town for work, my dad laid in bed. He had become immobile. With this, there was no question where I was to be for this game. My mind was no longer on all the things I dreamed about making this day into. My heart was… there was no other place I would rather watch this game then to be at my dad’s side. As I rushed home from out of town, my brother had got my dad out of bed and out to the living room. He was in his favorite chair. When I arrived, there he was. Not looking good, but in his favorite chair. I found my place next to him. I watched this game at his side sitting in his wheelchair. The halftime shows at the Superbowl are usually spectacular and yet I found myself during this halftime show getting my dad out of his favorite chair and onto the portable toilet we had brought into the room. Although I do not remember much more of the game. I remember the look in his eyes as he humbly, yet still, sat on that portable toilet as the Bucs had just won the game. He was so excited for me as he struggled to speak that which only his eyes could say. …It was a look that said, “I love you.“ that only a heart could produce. It was also a look that appeared to be held captive within a body that could no longer operate the way it once did. Have you ever wanted to just say something, but for some reason your lips wouldn’t move? This was the case and his eyes told the story. A story that played itself out in the only way that would seem right, that after all these years, my team won. After all these years, there was no place I would rather be. Shortly after the game, my post-game celebration consisted of getting my dad into bed and changing his adult-sized diapers. It was a painfully sad task, and not an easy one to accomplish at that. But, again…there was no place I would rather be. As we got dad settled into bed, my voice mail was busy being filled up by well-wishers congratulating me on the Bucs victory. At this point, the game seemed all too distant. The next day my dad was rushed to the hospital. It would be the last night he would spend in his home. A month and a half later. He was gone. It would be the last football game I would watch with my dad. Ironically, my dad was a 49ers fan. I watched with him a few weeks earlier as the Bucs knocked them out of the playoffs. In a weird way, it was like a father to son passing of the torch. I was always excited watching my dad’s joy as his team won. And now…one last time…yet for the first time…the joy was returned. It would not be until my birthday, one month after he died that I would realize the full extent of that Superbowl victory. I received a Buccaneer jersey and a special addition Sports Illustrated. That’s right…the Bucs did win!!! What a game! And now, seasons have come and gone, and yet…I…I will always have that ONE game…I will always have that ONE look. For it was in that one look that peace was found. It was a peace that but for a moment… took the pain of cancer away and replaced it with the fullness of time spent between a father and son. Sure this was just a game, but for me… it was much much more than that. How will you watch the game? I love memories that shape my heart! I hope to write something as beautiful as that one day! wow, thank you so much for your kind words. I look forward to reading your story.